Figure 1: Knee high grass polyculture in full sun designed for BRIT ecological detention structure. Part 8 of this series detailed the rationale and methodology for extracting qualified native plant species for use in creating polycultures. This month’s post features a discussion of how to successfully combine the species into a low maintenance native polyculture that can take the place of a monoculture groundcover. The 109 species selected for use in part 8 were sorted to find groupings unified by height, texture, line, color, or form. Two categories of plants were created for each of the main polycultures. The first is very aggressive groupings of lower plants that serve as the primary intermingled groundcover. The second group of plants for each polyculture are accent plants that are unified with the lower grouping by texture, line, color, or form, but also have a strong contrasting element that will show them to best advantage. These are either more transparent scatter plants or more opaque shrubby plants used more like rocks or small hill shapes. 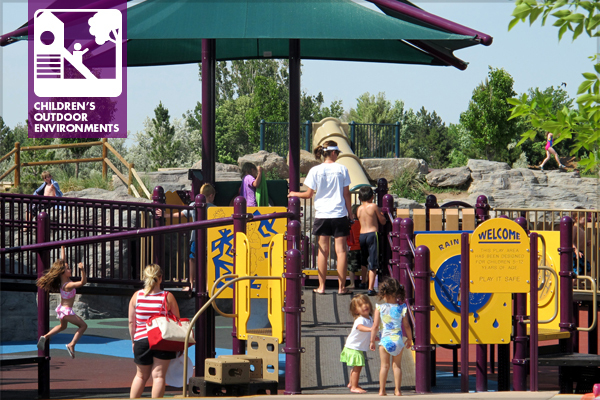 Ramp and steps located together provide equitable access to the play structure. The International Classification of Functioning, Disability and Health (ICF) suggests that disability is contextual. Environmental contexts can reduce or exacerbate disability. If an environment enables a young girl with a left leg amputation who uses a wheelchair to access spaces the same ways everyone else does, she is not disabled in this context. 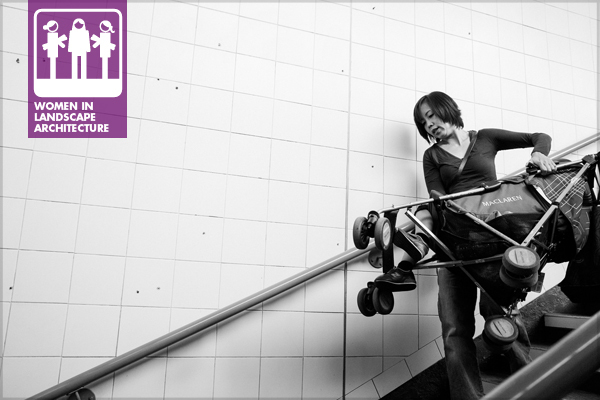 In accordance with the ICF, if she has to gain access to an environment via a steep ramp, be carried because the only access is steps, or be unable to enter at all, she is disabled. If she cannot participate or engage in the space, she is disabled in this environmental context. In the exemplar above, the ramp and steps are adjacent. The surface is crushed stone and the ramp slope is barely discernible. Both wheeled mobility users and those ambulating can equitably gain access to the Zen garden beyond the shelter. There is no backdoor entrance; all are equal and welcomed through the front door. Today I helped an architect friend of mine design the landscape for his recently remodeled midcentury ranch home. A few weeks ago, I also helped him construct a deck he had designed for the home’s front door. The deck was maybe the most interesting one I’ve seen in person. A long cantilever, intersecting volumes, slats, all the details one might expect from Mies van der Rohe. He did a great job of expressing the design language of the home, and I was excited to be a part of finishing up his vision, not to mention the enjoyment of working with a friend and frequent collaborator. In my market, the opportunity to work on projects with an established and well-defined design language is rare. During the 1950’s-1960’s, modernism came roaring in to my city and many gems were designed and built here. Many of them still remain, albeit in increasing states of deterioration. We have Frank Lloyd Wright’s only built residence in Florida (Spring House), single-family homes designed by notable architects, and several fantastic Brutalist structures (the most prominent being the Wesley Foundation at Florida State University, which was sadly demolished earlier this year). Modernism came in fast, and then all but vanished just a quickly. 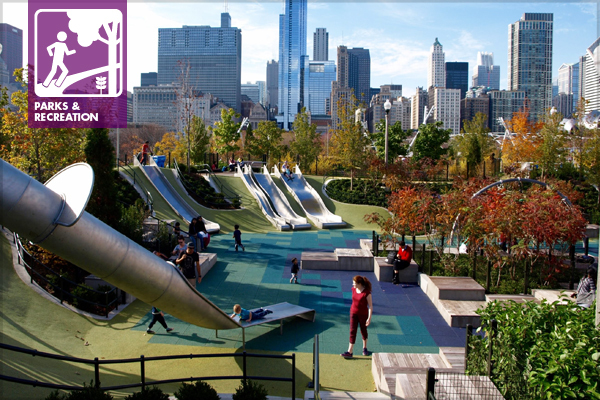 To highlight our members during Parks and Recreation Month, we are taking a look back at the last annual meeting of the ASLA Parks and Recreation Professional Practice Network (PPN). At that meeting, the PPN’s co-chairs came up with a few questions to spark conversations and let the attendees get to know one another, including identifying key areas of interest and trends in parks and recreation design and moments of inspiration they’ve had in public spaces. The meeting attendees came from across the country and from all stages of their careers, from students to senior landscape architects and firm principals. Read on to see some of the key questions, topics of interest, and inspiring places that are on Parks and Recreation PPN members’ minds. 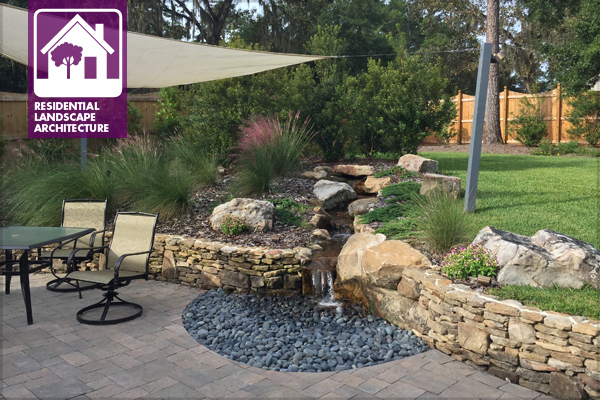 In our experience, there seems to be common interest among landscape architects as to what design software other firms are using in their offices. As technology is rapidly changing, the only constant is that we must regularly decide if the latest and greatest software has potential for our specific practice. Knowing what other successful firms are utilizing might be helpful as we wrestle with these decisions. Similarly, academics are curious of the latest practices in an effort to either integrate or validate course objectives. 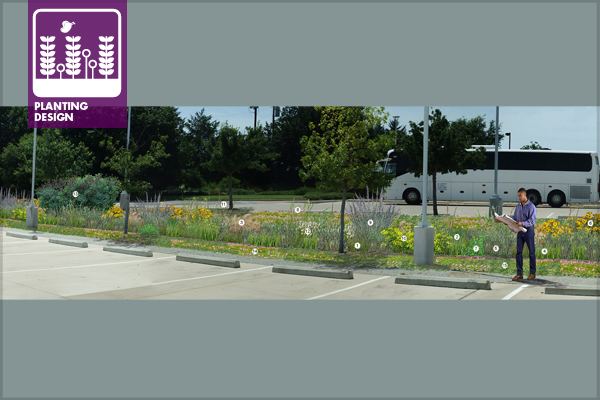 It’s with this curiosity in mind that we talked with 15 recent ASLA award-winning firms from across the country about the software they use in creating illustrative perspectives. The firms surveyed range in size but altogether represent 40% of the National ASLA awards in General Design and Analysis & Planning for the past 3 years. For context, most high-end perspectives are created across a series of software programs. 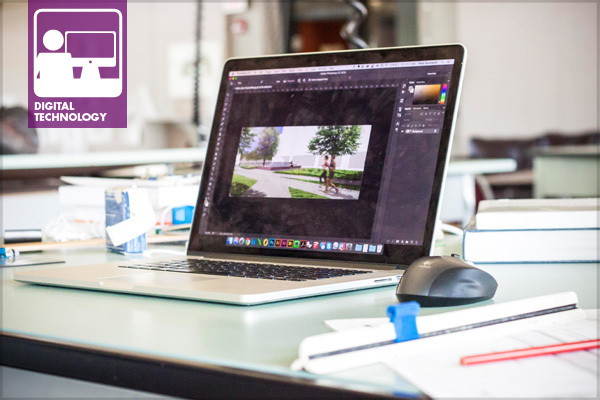 Typically, a 2D drafting program is used to build the site in plan view, a 3D modeling program projects up the site plan into 3-dimensional space, a rendering program exports 2D graphics with advanced materials and lighting, and a post-processing program is used for touch-ups and final edits. The results of the survey are broken into these 4 categories and are shown below. In a 2014 survey of ASLA’s Professional Practice Networks (PPNs), we asked members about their favorite cities and regions for practicing landscape architecture. Not surprisingly, there was no single answer that dominated the responses, which reflected the regional diversity of those who took the survey—the largest segment of respondents hailed from the West (30%), with roughly 20% each from the East, South, and Midwest, and 6% of respondents practice internationally. In Part I, we focused on the top choices for favorite cities and regions to work in, which covered much of the U.S.: the Pacific Northwest, Southern California and the Bay Area, the Midwest, New York City, and New England. 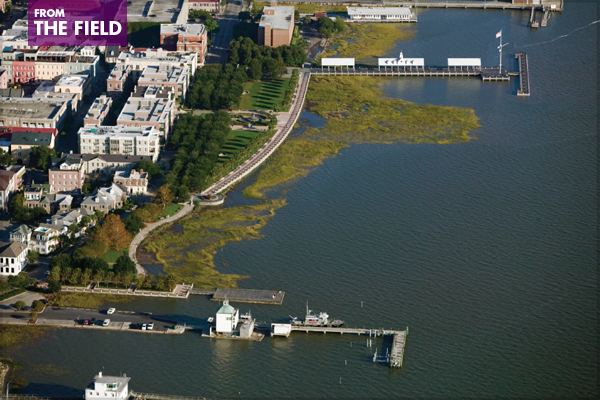 In Part II, we’ll focus on a few less frequent picks, ranging from international locations to regions in the U.S. you might not have considered landscape architecture hotspots before. Below, we highlight some of the most popular responses. 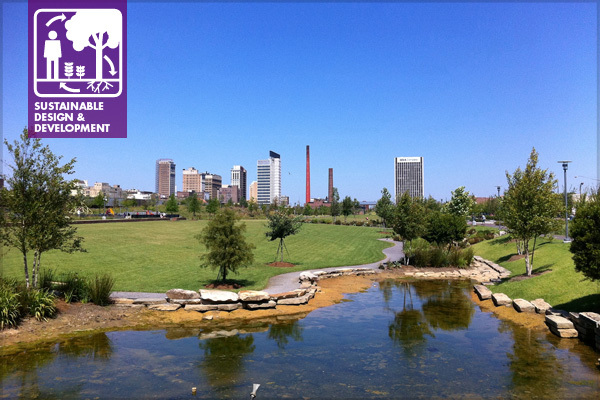 The following is the second installment of the two-part series excerpted from the Trust for Public Land’s (TPL) Center for City Park Excellence (CCPE) publication, City Parks, Clean Water: Making Great Places Using Green Infrastructure. To view Part I, click here. Is the physical relationship of the park to the surrounding community such that a redesign could reduce neighborhood flooding or the pollution of downstream waterways? Does the park have any available space for water flow and storage? Is the composition of the existing soils, water table, and underlying rock such that the park can absorb a significant amount of water in the necessary amount of time?